Your vacation starts on the plane. I’m watching Olivia Pope as she’s about to discover if one of her friends is dead or alive. Scratch that — any friend of Olivia’s is my friend. So, I’m about to figure out if our friend died when a flight attendant taps on my shoulder, telling me to store away my laptop before landing. Suddenly, my entire world is turned upside down, and I’m left worrying about the fate of the show. We’ve all experienced this same scenario. Whether it’s “Scandal,” “Heathers,” or “The Babadook,” you’ve played that frustrating game of finding the appropriate-length TV show to line up with your time spent in-transit. Well, now you can press play and say “thank you” to the universe — someone is looking out for us! The Netflix gods have created a genius guide called the “travel calculator.” This allows you to enjoy the journey to your next vacation without being interrupted at the worst times imaginable, causing your emotions to blow up like the Hulk. The next time you hit the road, skip the guessing game and download episodes of your favorite shows with the help of this handy-dandy guide. It does all the math for you, picking out the best options based on show lengths that align with your time in the car or on the plane. That’s right — you can finally stop living with constant anxiety that you might have to cut your precious viewing time short. It worked! You just landed and your emotions are still intact. You didn’t even have to go to the pilot and beg him to “just circle around in the air for like 10 more minutes, please!” so you can finish that episode. 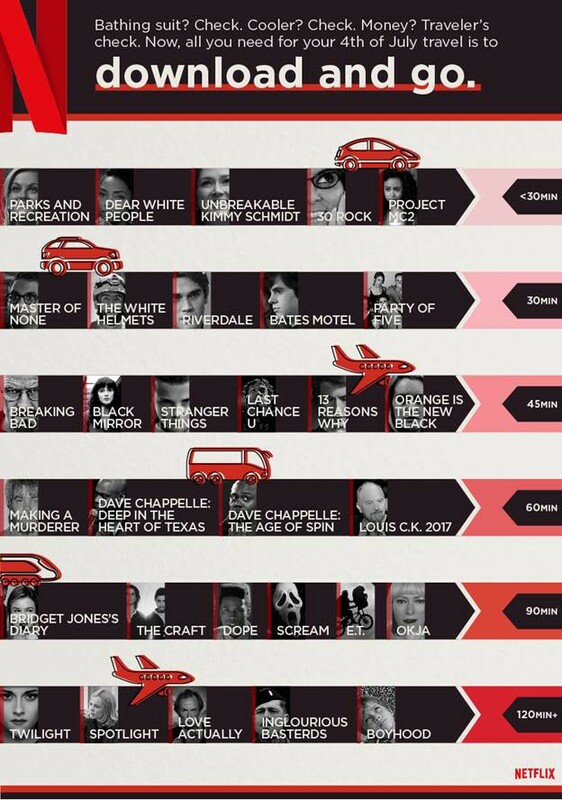 So, assemble your perfect Netflix schedule and get ready to sit back, relax and enjoy the (uninterrupted) ride. All titles will be ready to join you on your vacation by July 1st. Can A Broken Arm Really Predict The Weather?